Nutritional well-being in early life is typically assessed by growth.1 Both overweight and underweight reflect an imbalance between a child's actual intake and the energy required to support ideal height and weight. Although obesity is an urgent focus worldwide, it is undernutrition that carries the greater morbidity and mortality in the immediate and long term.2 Globally, approximately 20 million children are severely undernourished, contributing to 45% of all child deaths.2 Being either overweight or underweight in early life increases the likelihood of future cardiometabolic disorders, but undernutrition also threatens neural development, cognition, and academic achievement.2,3 Undernutrition among children in the United States and other Western countries often goes unrecognized and untreated, even when malnutrition is moderate to severe (ie, below the third to fifth percentile, or a z score of −2 to −3 standard deviations [SD]).4–6 The malnourished population usually consists of children with acute or chronic illnesses; children with special health care needs involving physical, developmental, behavioral, or emotional disorders; and children who are hospitalized. A recent expert panel on malnutrition cited three cause-based categories of diminished growth velocity: (1) acute illness resulting in a loss of energy and some nutrients, (2) chronic illness with severe deficits in both energy and nutrients, and (3) no apparent illness, which the consensus panel attributed primarily to energy deficit.5 The third category is the most common but also the least likely to be recognized by the primary care clinician early in its course. If “risk” is exclusively tied to a child's height and weight, then undernutrition in the absence of growth faltering will not merit intervention. But this implies that children in the “normal” range (5th to 85th percentile, or a z score of −1 to +1 SD) do not have the potential for adverse outcomes. Even in the absence of weight loss or overt nutrient deficiency, nutrient depletion alone may incur lasting problems. 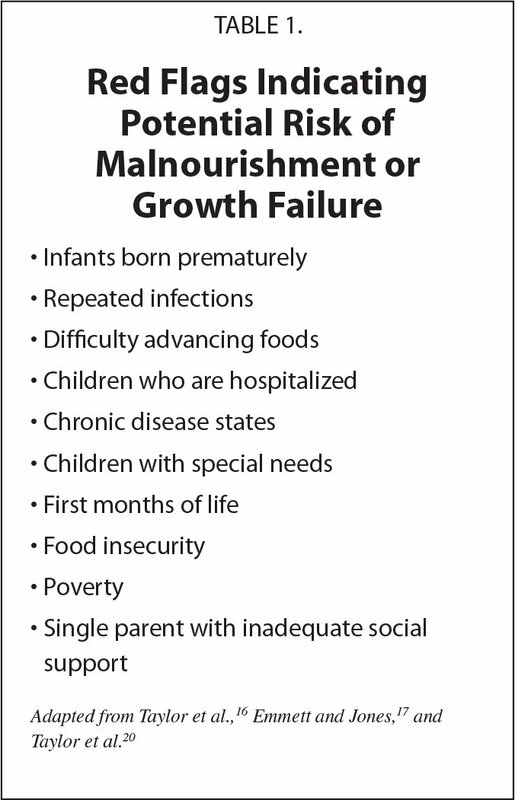 The developmental outcomes associated with undernutrition may be subtle and difficult to diagnose if they fail to elicit the overt clinical manifestations associated with moderate-to-severe growth failure (malnutrition or stunting, delayed wound healing, weakened immunity, infectious disease) or with overt nutritional deficiency states (iron-deficiency anemia, vitamin D-deficient rickets, zinc-deficiency perioral rash or diarrhea).6 Choline-deficiency symptoms such as fatigue, memory impairment, learning disabilities, and mood shifts are difficult to appreciate in young children, as are insufficiencies of docosahexaenoic acid, iodine, lutein, or precursors to neurotransmitters such as B vitamins, phenylalanine, tyrosine, or taurine. The second group potentially at risk for undernutrition is comprised of highly selective eaters. Complaints about how and what their toddlers eat are reported by more than 50% of parents in some studies.16 The Avon Longitudinal Study of Parents and Children,17 using clear and specific questions, identified 10% to 15% of children as particularly selective eaters with a potential risk for inadequate nutrition. The terms “picky” or “fussy” eater may bias against clinical urgency, but the time between parental complaints about dietary intake and physician concerns about growth represents a prolonged period of poor diet quality (Figure 1). 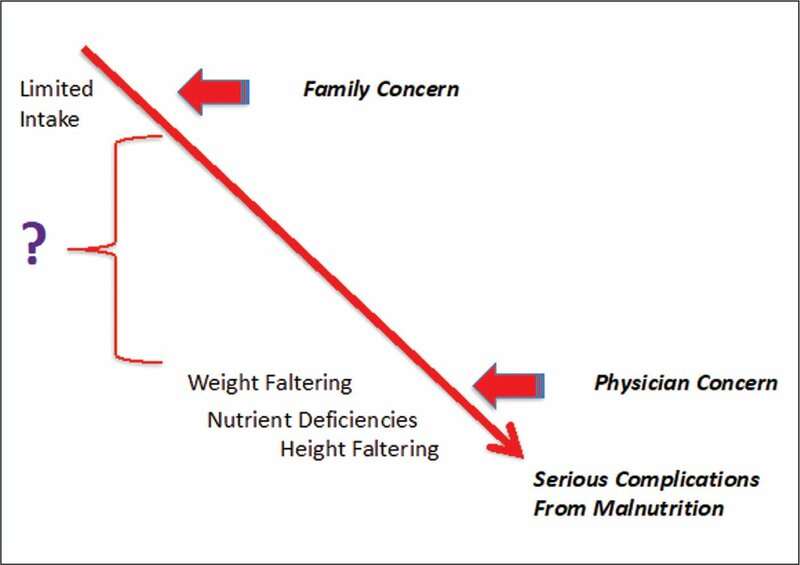 Continuum from parental concern to physician concern over malnourishment in early childhood feeding. The z scores and corresponding percentiles indicating growth failure (−2 and −3 SD below the mean or below the third percentile) versus those at risk for growth failure (−1 SD below the mean, or the 2.3 to 15.9 percentile). From Wikimedia Commons (https://commons.wikimedia.org/wiki/File:PR_and_NCE.gif), in the public domain; permission is not required. If clinical assessment identifies a child at risk for undernutrition, then intervention is indicated. In the past, supplements such as oils, starches, and high-calorie foods or drinks were used to increase energy intake. More balanced energy and nutrient supplements were reserved for moderate-to-severe growth failure, and were delivered orally, parenterally, or via gastric drip.1 However, the need for dietary intervention to support brain development along with weight and height suggests that more balanced supplementation is indicated. Alarcon et al.21 randomized a group of 3- to 5-year-old children (n = 92) who were between the 5th and 25th percentile for body mass index (BMI) to receive either dietary counseling alone or counseling plus a complete, balanced oral nutritional supplement (ONS; 40 kcal/kg/day) for 90 days. The study showed a significant improvement of weight-for-height in the ONS group at 60 days. At 90 days, there was no further increase, indicating that daily ONS did not cause obesity in this population. A larger (n = 200) and longer (48 weeks) study was undertaken by Huynh et al.22 with 3- to 4-year-old Filipino children who were between the 5th and 25th percentile for BMI. As in the study by Alarcon et al.,21 the control group received three sessions of dietary counseling alone, whereas the treatment group received counseling plus ONS providing 450 kcal/day. The data showed significant improvement of energy intake and weight-for-height ratio by 8 weeks. Like the study by Alarcon et al.,21 the results showed no evidence of obesity in the treatment group, even over the course of 48 weeks. Comparing pre- and post-diet diversity scores, Huynh et al.23 showed no decrement in diet quality due to prolonged ONS.23 Surprisingly, their data also showed a gradual rise in mean height-for-age among the ONS group, which did not peak until after 40 weeks of ONS therapy.22,23 This finding suggests that study children had experienced a degree of height restriction due to energy and/or nutrient inadequacy, despite being above the third percentile cut-off for growth failure. New research is changing the way pediatricians view the importance of nutrition's role in optimal infant and child development. More than simply fuel for growth, nutrition is vital for continued post-natal organ development, including the gastrointestinal tract, the immune system, and most importantly, the brain. Even before signs of growth faltering, undernutrition threatens optimal development. 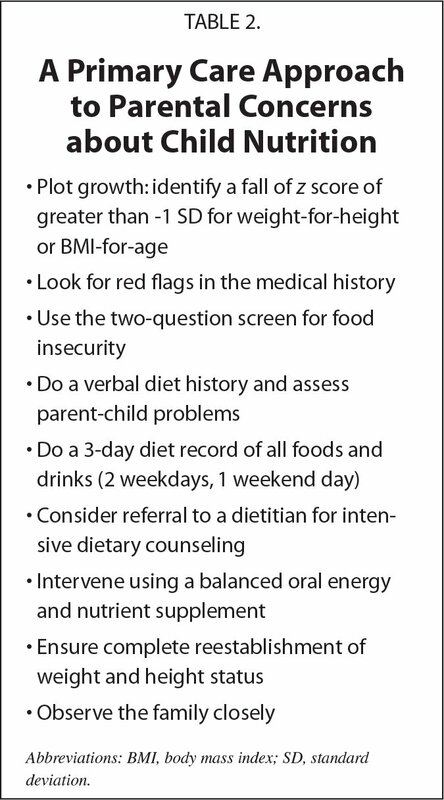 Using a simple approach (Table 2), the primary care clinician can assess the at-risk child, identify potential nutritional problems, and intervene effectively even before the child shows signs of overt growth failure. Primary care intervention is ideal when it uses balanced supplementation, supportive behavioral counseling, and close follow-up. Cole SZ, Lanham JS. Failure to thrive: an update. Am Fam Physician. 2011;83:829–834. Lenters L, Wazny K, Bhutta ZA. Management of severe and moderate acute malnutrition in children. In: Black RE, Laxminarayan R, Temmerman M, , eds. Reproductive, Maternal, Newborn, and Child Health: Disease Control Priorities. 3rd ed. Washington, DC: The World Bank; 2016. Son'kin V, Tambovtseva R. Energy metabolism in children and adolescents. In: Clark K, ed. Bioenergetics. London, UK: Intech Press; 2012:121–142. Nyaradi A, Li J, Hickling S, Foster J, Oddy WH. The role of nutrition in children's neurocognitive development, from pregnancy through childhood. Front Hum Neruosci. 2013;7:97. doi:10.3389/fnhum.2013.00097 [CrossRef]. Food Research and Action Center, American Academy of Pediatrics. Addressing food insecurity: a toolkit for pediatricians. http://frac.org/aaptoolkit. Accessed October 16, 2018. Robert D. Murray, MD, is a Professor of Pediatrics, Department of Pediatrics, The Ohio State University College of Medicine; and is a Nutrition Consultant, Robert D. Murray MD Nutrition LLC. Address correspondence to Robert D. Murray, MD, 1629 Berkshire Road, Columbus, OH 43221; email: murrayMD@live.com. Grant: R. D. M. reports grants from the Cardinal Health Foundation. Disclosure: Robert D. Murray reports personal fees from Abbott Nutrition Health Institute and from Abbott Nutrition during the conduct of the study; and personal fees from the Egg Nutrition Center, Cattleman's Beef Association, Dannon Co., Haas Avocado, Sabra Dipping Company, and American Dairy Association outside the submitted work.